Due to the rapid development of new technologies and the emergence of new threats on the modern battlefield, there is a need for new solutions in terms of weapon systems, the implementation of which cannot take place without considering the specific skills of their operation and maintenance. This cannot be achieved without an effective qualitative and quantitative system of training. There is a continuing need to acquire new skills so that the personnel, operating a modern system of combat, could use all its capabilities in an efficient and professional way. An important factor associated with the introduction of new weapons systems is the ratio of costs at the implementation stage to the final result. In the absence of adequate knowledge and skills, the need arises to obtain them from the outside, especially in the initial stage of implementation of the newly acquired weapon systems (which is connected with the introduction of a new system of training, operational use and logistics systems). Numerous examples can be brought to illustrate the ineffective implementation of new weapon systems, which, looked at over a period of time, did not lead to the system becoming an effective defense tool (for example, MiG-29, which has never been subjected to NATO TACEVAL tactical evaluation). In order not to repeat those mistakes, it is worth including specialized commercial entities in the implementation and support process where it is economically and rationally justified. The goal of each implementation of the new weapon system should be to gain control over it in terms of training, operational use and logistical support, while increasing autonomy of using it. The advantages of solutions based on supporting implementation processes by specialized external entities, especially in the initial period of using the new system, has been noticed by both NATO members and other countries confronting the problem of implementation of new weapon systems into their armed forces. The objective identification of one’s own initial capabilities at the stage of acquiring a new system and its implementation into the armed forces is key to success. Whenever the use of military personnel is associated with lower efficiency, solutions based on employment of highly specialized contractors are successfully applied. Taking into consideration that the efforts of military personnel should be totally focused on the continuous strengthening of their capabilities against real operational actions, everything else should be delegated to entities that will perform better and cheaper. They should continuously restore any lost combat capabilities by training military personnel with adequate quality and in sufficient quantities (dispersion of efforts of military personnel to actions directly unrelated to the acquisition of skills to conduct operations, deterrence and survival on the battlefield would potentially reduce the possibility of using the armed forces as a tool for implementing state’s policies). An important advantage of using contractual units is the possibility of their application in an ad hoc manner depending on needs. The use of contract staff competence, without the necessity of creating additional jobs, means that this solution is cheaper, which, in terms of continually shrinking budgets, is an important factor. a specialized training in the U.S. Air Force Base in Edwards. Such trainings rather than in the U.S. could also be successfully conducted in Poland, with considerable savings in time and money and based on domestic industry, e.g. with the participation of the Polish Armament Group (PGZ) remaining under control of the Polish MOD. An example of a constructive approach to building potential of military aviation and maximizing the invested funds are the United Arab Emirates. The country has put a lot of emphasis on the transfer of skills and technology to its own economy. Initially, they exported funds outside the UAE to train the crews of the F-16. This was only a temporary solution needed to raise competence and skills (currently training on the F-16 is implemented in the country based on its own resources and the resources contracted). In the long term this additional support in the form of the acquired know-how would make the system of training for the F-16 and the support system for the operational use of the combat platform become independent of external factors, and the UAE would gain access to additional skills and technologies to be used in other industries. This program has the support of the U.S. Department of State and is compatible with the International Traffic in Arms Regulations (ITAR – the rules governing trade of the U.S. weapons systems and services related to defense). Implementation of the F-16 to the Polish Air Force was an unprecedented event. The purchase did not apply only to the aircraft but was associated with the acquisition of a new, complete F-16 combat system, training systems, logistics support systems and operational use. Polish Air Force, the first from among the former Eastern bloc countries, has made the switch to complete Western system solutions that dramatically differed from the ones previously used. This process cannot be compared to the changes that have taken place in any of the countries of the former Eastern bloc, including the Czech Republic and the Republic of Hungary. Nevertheless, much remains to be done. Comparing the USAF F-16 system in terms of training, operational use (preparation, conduct and analysis of missions, targeting, weaponeering), support systems and knowledge of its capabilities and skills of their use to the Polish F-16 system it must be stated that the latter is far worse (the Polish Ministry of Defense was repeatedly informed about it at the time of previous governments by various officials including former U.S. Defense Attaché in Poland Col. Matthew Willis). The Air Force of the UAE may serve as an example for Poland. The UAE began to build their F-16 system at the same time as the Polish Air Force (today the UAEAF is taking part in two operations, with the use of seventy aircraft and they are training fourteen students on F-16 basic training, with additional training of seven instructor-pilots a year; at the same time they maintain a couple of aircraft in 24-hour duty – QRA). The knowledge and experience of the Polish army gained during many years of operation on the F-16 in Poland should result in a smooth transition to a new model of flight training supported by external parties who have appropriate knowledge and experience. It may be focused around the Polish defense industry represented, for example, by the Polish Armaments Group (PGZ). Another motivating factor for the F-16 users to develop their own independent training opportunities is the gradual reduction of the availability of the training in the United States and consequently its cost, which e.g. for an instructor-pilot on the F-16 is at a level of approximately 8 million USD (assuming that the entire training is carried out in the United States). In the past the group of EPAF countries (European Participating Air Force, a group of European users of the F-16), as a result of the lack of training opportunities in the United States tried to create a training center for the F-16 pilots in Portugal. However, due to the economic revisions of the U.S. policy towards European partners and a temporary increase in the number of training slots available at that time these efforts were abandoned. The Republic of Romania should also be mentioned here. In the last year it acquired the F-16 MLU from the Portuguese Air Force, and launched the creation of a new weapon system based on the Portuguese experience. In the coming years we should expect attempts to strengthen Polish-Romanian relations in the exchange of experiences in the use of the F-16 combat system. 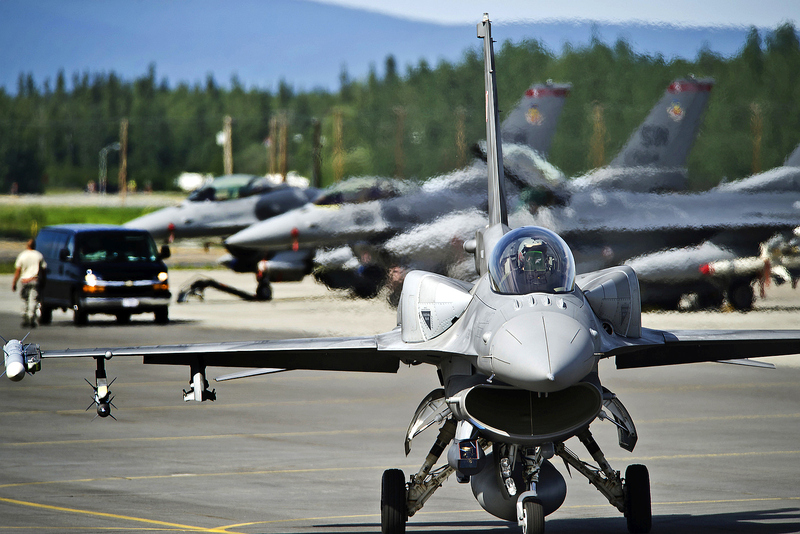 In the face of shrinking capacity of the training in the United States there are chances for a proposal of a joint training of the F-16 crew in Poland. There is of course no model solution to support mechanisms for training, which can be directly applied without any adaptation to local conditions. The experience gained by other users of the F-16, after the necessary adjustments to local conditions, may effectively serve as an example in building domestic training opportunities, so that in the future exporting financial resources could be avoided, and may become a source of domestic benefits and even political gains. Support of training and logistics processes in the Armed Forces by external entities possessing a dedicated, professional team of specialists is justified operationally and economically as it is a quick way to acquire competence, maintenance and recovery of efficiency of military equipment, as proved by the experience of other countries (e.g. in February 2016 the British Ministry of Defense signed a contract with Affinity Flying Services Limited which organized and conducted a multi-level training system for military aviation personnel). The way to avoid the dramatic situation regarding the insufficient level of training and insufficient number of Polish F-16 pilots now and in the future is to move the training effort to the country. The system of training needs to be supported by the knowledge and experience of contracted crew and experts. In the case of additional purchase of the F-16 and, therefore, increased demand for personnel flying this tactical aircraft, the Polish Air Force would experience problems with insufficient training even more, and such a scenario is currently experienced by most F-16 users in the world. Consequently, this may result in dramatic failure and operational inability of the entire of F-16 combat system. The skills of experienced instructors flying the F-16 are a commodity very sought after and highly valued. It is expected that the Polish instructors flying the F-16 would gradually disappear to reserve in the next year or two, and would feed a labor market which is very attractive in terms of wages (currently salaries of a contract instructor-pilot on the F-16 in the Middle East countries reach 250,000 USD net per year). The outflow of personnel to commercial entities is normal and no regulations can inhibit this process (there are also cases where experienced instructors leave before reaching retirement age). The armed forces are not able to compete effectively with this market trend, which naturally enforces the rotation of officers in the structures of air bases. There is also a risk arising from the possibility of transition of military personnel to civilian passenger and freight transport markets in the country and abroad. A number of job offers as a commercial pilot has been increasing rapidly. Therefore, in the coming years such a state of affairs will cause hardly controllable phenomenon of departures of military personnel to the reserve. The provision of training in the country, supported by experienced instructors acquired under the contract would: optimize the cost of training an F-16 aircraft pilot; improve the system of training in the country; create autonomous and independent training opportunities; bring more substantial fulfillment of obligations to NATO; achieve regional leadership in the F-16 training. The use of Polish instructors-pilots (on whose training huge amount has been spent), who decided to go to the reserve, is not currently possible due to the lack of systemic solutions, which would enable their re-employment in the system of training as professional assistance. Supporting training systems by closely specialized, selected and experienced contracted staff would influence the undisturbed process of training in case of the operational use of personnel resources from military units in real combat operations. In the case of the F-16 squadrons, each exercise or operational activity related to the dislocation of forces and means limits or prevents training. Supporting this process by instructor-pilot contractors (including those who have recently been part of squadrons and air bases), would have an important impact on ensuring the continuity of the training process, but also on maximizing the use of financial resources incurred in the process of training flight instructors. Montenegro – the next member of NATO?